Tony Danza | Diary of a Public School Teacher! It’s a holiday weekend, and I have a little more time on my hands than usual. I wanted to get away, but that didn’t quite work out. 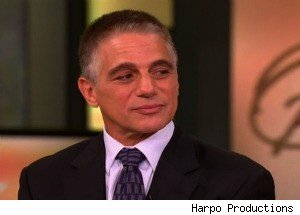 So, I decided to spend a little more time on the computer than I normally do, and I came across this article about Tony Danza, teacher. Now I use the word “teacher” lightly, very, very, lightly. This article was posted in September 2010, but I think it’s relevant to what people think of teachers. The network decided to do a reality series called, “Teach”. They think and they think, and someone says, “I know who we could get! ?” “Tony Danza!” Seriously? Not one of the Teacher of the Year candidates? They didn’t think of me? Or any of the millions of hard-working, talented, teachers that work diligently every day of their lives? “Even though Tony describes teaching as his “dream job,” he only did it for the year that he was paid to be on A&E — which … well, you can draw your own conclusions here.” Hmmm… What conclusion can we draw? What a farce! He “taught” so that he could get paid to be on television. Is this a person you would want teaching your kids for a year? What a waste of a school year! I would love to know how he was held accountable. “After originally being rejected by the New York school system, Danza eventually convinced the folks in Pennsylvania to let him teach. However, he never actually managed to get certified as a real teacher. So he had to have a second “co-teacher” in his classroom, who would observe and monitor him. In addition, because of his lack of certification, Tony only taught two classes a day. (Actual high school teachers have to teach between four and seven classes a day. )” This sums it up. This is what people think of our profession, we are just warm bodies in the room. Why did I bother to go to school and get my BS and my MS? I should have become an actor, have someone offer me a reality show, and pretend to teach for a year. I wold have made enough money so that I could quit teaching and go back to my acting career. It’s scary out there! More and more, teachers are being held accountable for low test scores, low test scores from students who can’t read. Back in the 80’s, you had a small group of students in the “low” group, and the rest were average or excelled. Flash forward to 2010, and those “low” students are now the majority. Why can’t they read?!!! I have been struggling with this question for the past few years, it is so frustrating. I have tried a multitude of strategies, refusing to give up. Is it the lack of books at home? Is it just that they don’t care? Is it the lack of conversation and the almost nonexistent vocabulary? Is it …..????? What do you do with students who, year after year, program after program, show no progress, literally, none! One parent asked to have her kid tested, she is frustrated as well because her daughter has been pulled out for reading groups for years.